"Deep Space Nine" and "DS9" redirect here. For the fictional space station, see Deep Space Nine (fictional space station). Star Trek: Deep Space Nine (DS9) is an American science fiction television series created by Rick Berman and Michael Piller. It originally aired from January 3, 1993, to June 2, 1999, in syndication, spanning 176 episodes over seven seasons. The fourth series in the Star Trek franchise, it served as the third sequel to Star Trek: The Original Series. Set in the 24th century, when Earth is part of a United Federation of Planets, it is based on the eponymous space station Deep Space Nine, located adjacent to a wormhole connecting Federation territory to the Gamma Quadrant on the far side of the Milky Way galaxy. Following the success of Star Trek: The Next Generation, Paramount Pictures commissioned a new series set in the Star Trek fictional universe. In creating Deep Space Nine, Berman and Piller drew upon plot themes developed in The Next Generation, namely the conflict between two alien species, the Cardassians and the Bajorans. Deep Space Nine was the first Star Trek series to be created without the direct involvement of franchise creator Gene Roddenberry, the first set on a space station rather than a traveling starship, and the first to have a person of color—Commander Benjamin Sisko (Avery Brooks)—as its central character. Changes were made to the series over the course of its seven-year run. For the third season, the starship USS Defiant was introduced to enable more stories away from the space station, while the fourth saw the introduction of Worf (Michael Dorn), originally from The Next Generation, as a recurring character. The final three seasons dealt with a recurring story arc, that of the war between the Federation and an invasive Gamma Quadrant power, the Dominion. Although not as popular as The Next Generation, Deep Space Nine was critically well-received. Following the success of Deep Space Nine, Paramount commissioned Berman and Brannon Braga to produce Star Trek: Voyager, which began in 1995. During Deep Space Nine's run, various episode novelisations and tie-in video games were produced; after the show ended, various novels and comics continued the crew's adventures. Some video games included Harbinger in 1996, The Fallen in 2000, and Dominion Wars. Deep Space Nine centers on the formerly Cardassian space station Terok Nor. After the Bajorans have liberated themselves from the long and brutal Cardassian Occupation, the United Federation of Planets is invited by the Bajoran Provisional Government to administer joint control of the station, which initially orbits Bajor. The station is renamed Deep Space Nine, and a Starfleet crew is assigned to manage it. Shortly after their arrival, the Starfleet crew discovers a stable wormhole in Bajoran space leading from the Alpha Quadrant to the Gamma Quadrant, and the station is moved to a strategic position near the wormhole's entrance to safeguard it from the Cardassians. Deep Space Nine and Bajor quickly become a center for exploration, interstellar trade, political maneuvering, and open conflict. Threats come not only from Cardassians, Klingons and Romulans from the Alpha Quadrant, but later from the Dominion, an alliance of alien species from the Gamma Quadrant that take up arms alongside the Cardassians against the Federation and its allies starting in Season 3. Deep Space Nine becomes a key military base for the Federation in the Dominion War, and is assigned the starship USS Defiant to aid in its protection. According to co-creator Berman, he and Piller considered setting the new series on a colony planet, but they felt a space station would appeal more to viewers, and would save the money required for a land-based show's on-location shooting. They did not want the show set aboard a starship because Star Trek: The Next Generation was still in production, and in Berman's words, it "seemed ridiculous to have two shows—two casts of characters—that were off going where no man has gone before." While its predecessors tended to restore the status quo ante at the end of each episode, allowing out-of-order viewing, DS9 contains story arcs that span episodes and seasons. One installment often builds upon earlier ones, with several cliffhanger endings. Michael Piller considered this one of the series' best qualities, allowing repercussions of past episodes to influence future events and forcing characters to "learn that actions have consequences." This trend was especially noticeable toward the series finale, by which time the show was intentionally scripted as a serial. Unlike Star Trek: The Next Generation, interpersonal conflicts were prominently featured in DS9. This was at the suggestion of Star Trek: The Next Generation's writers, many of whom also wrote for DS9, who felt that Roddenberry's prohibition of conflicts within the crew restricted their ability to write compelling dramatic stories. In Piller's words, "People who come from different places—honorable, noble people—will naturally have conflicts". Benjamin Sisko is the Starfleet officer placed in charge of Deep Space Nine. At the start of the series, he is a grieving widower (his wife having been killed by the Borg at the Battle of Wolf 359) and the father of a pre-teenage son, Jake. He and Jadzia Dax discover the Bajoran wormhole, which the Bajorans believe is the home of the Prophets, their gods and protectors. The Bajorans hail Sisko as the Emissary of the Prophets, an exalted religious status that initially makes him uncomfortable. Due to his exemplary leadership, at the end of the third season, he is promoted from commander to captain and becomes a key leader of Federation forces against the Dominion. In the seventh season, it is revealed that Sisko's biological mother was one of the Prophets, using the body of a human woman. Kira Nerys is a Bajoran militia officer, former guerrilla fighter during the Cardassian Occupation of Bajor, and, as the station's Bajoran liaison officer, Sisko's second-in-command. She is initially suspicious of the Federation's intentions toward her planet, but grows to trust and befriend the rest of the crew. Like most Bajorans, she is deeply religious, which, in her opinion, makes it awkward having the Emissary to the Prophets as her commander. Ro Laren, a character from Star Trek: The Next Generation, was the first choice of the producers for Sisko's first officer, but Michelle Forbes did not want to commit to a television series. Constable Odo is the station's chief of security. He is a Changeling, capable of assuming any shape he wishes, but usually assumes a shape of a male adult humanoid. He was found in the Denorios Belt, brought back to the planet Bajor by the Cardassians (who maintained a military occupation of Bajor), and raised in a laboratory by a Bajoran scientist, Doctor Mora. Odo yearns to find his own people, but when he finally does, he is less than pleased to discover that they rule the Gamma Quadrant with an iron fist. Quark is the owner of a bar. Like most of his species (with the notable exceptions of his brother Rom and eventually his nephew Nog), he is extremely greedy and willing to do whatever it takes to acquire more latinum, and his often legally questionable means repeatedly brings him into conflict with Odo. Quark does, however, display a moral code on several occasions during the series, electing to save lives rather than obtaining monetary benefit. Sisko also considers Quark an anchor to the merchant community and social potpourri of the station and repeatedly takes steps to keep him in operation on the station. Julian Bashir is the station's chief medical officer. Although Human, his parents had him illegally genetically enhanced when he was a child because he could not keep up with his peers. Somewhat tactless, he nevertheless develops friendships with several of the station's residents, particularly Miles O'Brien and, more ambiguously, a mysterious Cardassian named Garak. Siddig appears in the opening credits as Siddig el Fadil, a shortened form of his birth name, for the first three seasons. He was credited as Alexander Siddig after discovering that viewers did not know how to pronounce his name. Siddig continued to be credited as Siddig el Fadil when he directed. Jadzia Dax is the station's Trill science officer. She shares a symbiotic existence with a long-living symbiont named Dax, who has already experienced seven prior lives "joined" with other Trills. The previous host, a larger-than-life federation diplomat and womanizer Curzon Dax, had been a close friend of and mentor to Sisko, who often refers to Jadzia as "old man" as a friendly joke. She eventually marries Worf during the course of the war with the Dominion. Jadzia is killed by Gul Dukat at the end of season 6. Ezri Dax was added to the series after the abrupt departure of Terry Farrell. Farrell's character was killed off and the writers introduced Ezri as a young Trill Starfleet officer and the next host of the Dax symbiont. Unprepared and untrained for the role, she is often frustrated by aspects of the symbiotic relationship and the eight lifetimes worth of memories she inherits. She also confronts the memories of Jadzia's love for Worf as well as her own attraction to Dr. Bashir. The fourth season saw the addition of Michael Dorn to boost ratings. Dorn had recently finished seven years on Star Trek: The Next Generation as the Klingon Worf. Worf transfers to Deep Space 9 when the brief war between the Federation and the Klingon Empire breaks out, and stays on as Strategic Operations officer and later as a liaison to the Klingon Empire. He eventually marries Jadzia Dax. Miles O'Brien is the Chief of Operations, keeping the station in working order. He is married to botanist and teacher Keiko. They have a daughter, Molly, and later a son, Kirayoshi. O'Brien is the first main non-commissioned Starfleet character, reprising a supporting role in The Next Generation, as an "uncomplicated" and well-studied hardware technician. Jake is Benjamin Sisko's son. He decides not to follow in his father's footsteps as a Starfleet officer, desiring to be a writer and reporter instead. He at first resents the idea of living on an old Cardassian space station, but soon learns to adapt. He develops a deep friendship with Nog, a Ferengi who is the station's only other inhabitant in his age group. Jake eventually becomes a reporter with the Federation News Service. Throughout the seven seasons, both Jake and Nog evolve from young children into young men with storylines showing their rites of passage, successes, and mishaps. 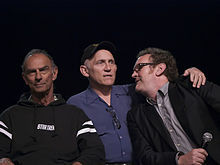 Marc Alaimo, Armin Shimerman and Colm Meaney, who portrayed the characters of Gul Dukat, Quark and Miles O'Brien, respectively. The setting of the series—a space station rather than a starship—fostered a rich assortment of recurring characters. It was not unheard of for "secondary" characters to play as much of a role in an episode as the regular cast, if not more. For example, "The Wire" focused almost entirely on Elim Garak, while "Treachery, Faith, and the Great River" featured Weyoun, with a secondary plot centered on Nog. "It's Only a Paper Moon" relied on Nog and holographic crooner Vic Fontaine (James Darren) to carry the story. Several Cardassian characters figure prominently in DS9, particularly Gul Dukat, a senior member of the Cardassian military involved in the occupation of Bajor, played by Marc Alaimo. A complex character, Dukat undergoes several transformations before ultimately resolving as a profoundly evil character, and Sisko's archenemy, by the show's conclusion. A StarTrek.com article about Star Trek's greatest villains described Gul Dukat as "possibly the most complex and fully-developed bad guy in Star Trek history". Elim Garak, portrayed by Andrew Robinson, is the only Cardassian who remains (in exile) on the space station when the Federation and the Bajorans take over. Widely suspected of being an agent of the Obsidian Order, the feared Cardassian secret police, he maintains that he is merely a simple tailor. Garak's skills and contacts on Cardassia prove invaluable on several occasions, and he becomes a pivotal figure in the war with the Dominion. Damar (Casey Biggs) is initially a glinn serving under Gul Dukat aboard the freighter Groumall, later to become his loyal aide and rise in stature as Dukat regains prominence. He becomes the new leader of the Cardassian Union when Dukat has an emotional breakdown, precipitated by his daughter's death at the hands of Damar ("Sacrifice of Angels"). As the Dominion War progresses, Damar becomes increasingly dissatisfied with Cardassia's relationship with the Dominion. The tipping point is reached when the Dominion forms an alliance with the Breen and Cardassia is relegated to a secondary and increasingly marginalized role ("Strange Bedfellows"). Damar forms and leads an insurgency against the Dominion, playing a vital role in its eventual defeat ("What You Leave Behind"). Nana Visitor and René Auberjonois, who portrayed the characters of Kira Nerys and Odo, respectively. Jeffrey Combs (of Re-Animator fame) has stated that he had auditioned for the role of William Riker on Star Trek: The Next Generation, but when Jonathan Frakes (who won the part) later directed the DS9 episode "Meridian", he recommended Combs for a part. Combs made his Star Trek and DS9 debut as a one-episode alien named Tiron, before being cast as the Ferengi Brunt and the Vorta Weyoun. He would go on to appear in 31 episodes of DS9, playing four distinct characters—five, if one counts the "mirror universe" version of Brunt. In "The Dogs of War", he also became one of the few Star Trek actors to play two distinct roles (Brunt and Weyoun) in the same episode. He also appeared in the series Star Trek: Enterprise as the Andorian commander Shran. He is one of the few actors to have appeared in three Star Trek series. In addition to Quark and his brother Rom (Max Grodénchik), several other Ferengi had recurring roles, among them their shrewd mother Ishka (Andrea Martin, later Cecily Adams), who eventually engineers a social revolution on the Ferenginar, the Ferengi home world; Rom's son Nog (Aron Eisenberg), the first Ferengi to join Starfleet; and Grand Nagus Zek (Wallace Shawn), the Ferengi leader. Though she is Bajoran, the character Leeta (Chase Masterson), a Dabo girl in Quark's bar and later Rom's wife, is sometimes involved in the Ferengi storyline. After Ishka's social revolution, Grand Nagus Zek names Rom as the Grand Nagus to lead the "new" Ferenginar. The Klingon Empire plays a more significant role in DS9 than in any other Star Trek series. Aside from Worf, recurring Klingon characters include Chancellor Gowron (Robert O'Reilly), leader of the Empire, who previously appeared in The Next Generation. In one of the series' final episodes, he was challenged and killed by Worf for sending Klingon troops on suicide missions to discredit General Martok (J. G. Hertzler) during the Dominion War; after killing Gowron, Worf passes leadership of the empire to Martok. Kor, a Klingon character from Star Trek: The Original Series resurfaces in three DS9 episodes. One of them, "Blood Oath", unites Kor with two other Klingons from the original series: Koloth and Kang. John Colicos, William Campbell and Michael Ansara reprised their original series roles. Morn is a minor character who is a fixture in Quark's establishment, sitting at the bar over the course of seven years. According to The Star Trek Encyclopedia, it became a running joke that, despite the other characters' remarks on how talkative and funny he is, he never speaks a word on camera. Morn did have a line in the script for pilot episode "Emissary", but it was cut due to run time considerations, after which the creators conceived the joke that he never talks. Star Trek:Deep Space Nine ran for seven seasons, from 1993 to 1999. The first season started half-way through the typical broadcast season running from fall to spring and had fewer episodes than typical Star Trek runs. Starting with Season 4, a major addition to the cast was Worf adding in another carryover from Star Trek:The Next Generation. When that show ended its run, another spin-off Star Trek: Voyager was also started after the end of that series on United Paramount Network rather than the syndicated network. Meanwhile the cast of that show shifted to feature films, which lead to Worf being the only main Deep Space Nine character to reach the 'big screen'. Major plotlines focus on several key Star Trek cultures, especially interactions between the Bajorans, Cardassians, Ferengi, Klingons, and the Federation. Many of these cultures are represented by major characters in the main or recurring cast. Major arcs revolve around Bajor's recovery from Cardassian occupation; the Maquis, a rebellious Federation splinter group; and the Dominion, a hostile imperial power from the other side of the galaxy. The war between the Dominion and the Federation spans several later seasons of the show. In the first episode, Starfleet Commander Benjamin Sisko arrives (along with his young son, Jake) at Deep Space Nine, a space station formerly run by the Cardassians during their oppressive occupation of Bajor, a planet that the space station orbits. He is assigned to run the station jointly with the newly liberated Bajorans as they recover from the Cardassian occupation, to help pave the way for Bajor's entry into the Federation. Sisko and Jadzia Dax stumble upon the first stable wormhole found and discover that it is inhabited by beings who are not bound by normal space and time. To the strongly religious people of Bajor, the wormhole aliens are their gods (the Prophets) and the wormhole itself is the long-prophesied Celestial Temple, where they reside. Sisko is hailed as the Emissary of the Prophets, through whom the Prophets primarily act. This provides the basis for a long-lasting story arc. Sisko initially considers his role as a religious icon with open discomfort and skepticism, referring to the Prophets as "wormhole aliens" and striving to keep his role as commander of the station distinct from any religious obligations that the Bajorans try to place on him. Later, he becomes more accepting of his role and, by the end of the series, he openly embraces it. The political and religious implications of this on the Bajorans and its spiritual leaders (most notably, Winn Adami) also provide a central arc that lasts until the end of the series. The station crew early on has to contend with a human resistance group known as the Maquis. Rooted in the events of The Next Generation episode "Journey's End", in which Native American settlers refuse to leave when their colony world is given to Cardassia as part of a treaty, the Maquis are an example for the show's exploration of darker themes: its members are Federation citizens who take up arms against Cardassia in defense of their homes, and some, such as Calvin Hudson, a long-time friend of Sisko's, and Michael Eddington, who defects while serving aboard the station, are Starfleet officers. The show’s sharp departure from traditional Star Trek themes can be seen in episodes such as "For the Cause", in which Eddington complains to Sisko, "Everybody should want to be in the Federation. Nobody leaves paradise. In some ways, you're even worse than the Borg. At least they tell you about their plans for assimilation. You assimilate people and they don't even know it." The Maquis also allow DS9 to subvert some longstanding Star Trek icons: Thomas Riker, a duplicate of Enterprise-D first officer Commander William Riker (also played by Jonathan Frakes; character first appeared in ST:TNG's "Second Chances" episode), is revealed in the episode "Defiant" to be a member of the Maquis who gains access to the station's crew and facilities by impersonating the Enterprise's Riker. The second-season episode "Rules of Acquisition" marks the first mention of the Dominion, a ruthless empire in the Gamma Quadrant, though they are not fully introduced until the second-season finale, "The Jem'Hadar". It is led by "the Founders", a race of shape-shifting Changelings, the same species as station security chief Odo. They were once persecuted by non-shape-shifters (whom they call "Solids") and they seek to impose "order" upon any who could potentially harm them, which includes nearly all Solids. The Founders have created or genetically modified races to serve them: the Vorta, sly and subversive diplomats, and the Jem'Hadar, their fearless shock troops. These races worship the Founders as gods. At the start of DS9's third season ("The Search"), with the threat of a Dominion attack looming from the other side of the wormhole, Commander Sisko returns from Starfleet Headquarters on Earth with the USS Defiant, a prototype starship that was originally built to fight the Borg. It remains stationed at Deep Space Nine until season seven, providing an avenue for plot lines away from the station. With the third season, writers from the now completed The Next Generation began to write regularly for DS9. The Dominion forms an uneasy alliance with the Cardassians in the fifth-season episodes "In Purgatory's Shadow" and "By Inferno's Light" and goes to war with the other major powers of the Alpha Quadrant in the season finale "Call to Arms". Throughout the series, loyalties and alliances change repeatedly: pacts with the Cardassians are made, broken, and remade; a short war with the Klingons flares up and is settled, and the formerly neutral Romulans ally themselves with the Federation. This last alliance is made in an attempt to turn the war around, but comes as a result of criminal and duplicitous acts on Sisko and resident Cardassian Garak's part, thus providing an example of the moral ambiguity prevalent in DS9 in comparison to the other Star Trek series. Another example of DS9's darker nature is the introduction of Section 31, a secret organization dedicated to preserving the Federation way of life at any cost. This shadow group, introduced in "Inquisition", justifies its unlawful, unilateral tactics by claiming that it is essential to the continued existence of the Federation. Section 31 repeatedly states any inquires made into the matter with the Federation, they will deny Section 31's existence. Section 31 features prominently in several episodes of the Dominion War arc, especially as it is revealed that it attempted a genocide of the Founders. In DS9, the Ferengi are no longer an enemy of the Federation, but rather an economic power whose political neutrality is, for the most part, respected. A number of episodes explore their capitalistic nature, while others delve into the race's sexist social norms. Unlike their depiction in Star Trek: The Next Generation, where they were generally portrayed as sexist buffoons for comedic purposes, in DS9 they received a more complex depiction, with the female partner (Ishka) of the Grand Nagus leading a women's rights rebellion on the Ferengi homeworld, and Rom, Quark's brother, leading a strike against unfair working conditions in Quark's bar. Also, Jake Sisko's best friend, Nog, has to deal with Starfleet's more liberal attitudes towards women while Jake learns to deal with his friend's cultural background in a respectful manner rather than risk the loss of their friendship. Nog later decides to join Starfleet, the first Ferengi to do so. Several episodes of DS9 explore the theme of the Mirror Universe, first touched upon in the Star Trek: The Original Series episode "Mirror, Mirror". In the second-season episode "Crossover", the DS9 crew first becomes aware of this alternate universe when Kira and Dr. Bashir experience operational difficulties while traveling through the Wormhole and wind up back on the station in the Mirror Universe dominated by the Klingon–Cardassian alliance. They discover that it is not DS9 to which they have returned but Terok Nor. Bajor is not friendly and there is no Federation here. "Terrans", as they are called in this universe, are ruthless barbarians according to the Intendant (Kira's mirror self) – the Terran Empire occupied Bajor for decades much as Cardassia had in the normal universe. The Klingon–Cardassian alliance eventually formed and Bajor was freed from Terran occupation, later enslaving Terrans as ore miners on the orbiting space station Terok Nor. Enslaved as they are, the Terran workers liberate themselves and form a resistance movement, as seen in several other DS9 episodes ("Through the Looking Glass", "Shattered Mirror", "Resurrection", "The Emperor's New Cloak"). Over the course of the seven seasons, we see characters come and go, and the station provides a chance to see characters from elsewhere in the Star Trek universe grow further, such the O'Brien family, including Miles, Keiko, and Molly. Gowron No No Yes Yes Yes No 2 ep. The series was created by Rick Berman and Michael Piller at the request of Brandon Tartikoff, and was produced by Paramount Television. As overall head of Star Trek production, Berman served as executive producer for the series's entire run. Piller initially served as second executive producer and showrunner, but left the series in 1995 to manage Star Trek: Voyager. Writer Ira Steven Behr was promoted by Berman to replace Piller as showrunner and held that role for the remainder of the series. In addition to Berman, Piller, and Behr, key writers included Robert Hewitt Wolfe, Ronald D. Moore, Peter Allan Fields, Bradley Thompson, David Weddle, Hans Beimler and René Echevarria. DS9 was the first television series in the Star Trek franchise to use computer-generated imagery (CGI) for exterior space shots. Although a few other television series, like Babylon 5, were using CGI exclusively to avoid the high expense of model photography, the Star Trek franchise had continued to use primarily physical models for exterior space shots because producers felt models provided more realism. The USS Defiant was the first full-fledged starship in the Star Trek franchise to have a CGI model used in regular production. It was first built and animated by VisionArt, which was responsible for the morphing of Odo. The CGI Defiant was featured heavily in the Season 4 episode "Starship Down", where it battled a CGI Jem'Hadar ship in a CGI gas giant's atmosphere. However DS9 also continued using models where needed, such as the season 4 premier and the alternate-universe episode "Shattered Mirror". "During the battle sequences between the Federation and Klingon fleets, the effects department used Playmates toys, Ertl model kits and Hallmark Bird-of-Prey Christmas ornaments in the background in an effort to keep production costs down." The series started using Foundation Imaging and Digital Muse in 1997 (Seasons 6 and 7) for its effects as part of the ongoing storyline of the Dominion occupation of the station. However, the Deep Space Nine station itself remained a physical model throughout the series' seven-year run except for the final scene of the series. In October 2006, the physical model of the station was sold for $132,000 in an auction at Christie's auction house in New York City. The opening sequence was likewise modified in the fourth season, most notably by the introduction of CGI inserts of construction work being performed on the station's exterior by suited maintenance crews, and more docking and launching activity by ships, along with subtle colored wisps of nebulae added to the background starfield. Accordingly, the solo trumpet (preceded by a solo French horn) featured prominently in the main theme by Dennis McCarthy to accentuate the lonely isolation of the outpost was augmented by a chorus of brass as the station attained a more bustling atmosphere following the presence of the wormhole. The digital effects were done at television resolution and thus the series cannot be re-released in HD format without re-doing the special effects. Overall 176 episodes of Star Trek: Deep Space Nine would be produced. As mentioned, Deep Space Nine debuted in January 1993 with the double-episode "The Emissary", half-way through the 6th season of The Next Generation. This marked the first time in the history of the franchise that two series were airing concurrently, which would continue until DS9 ended in 1999. DS9 was the sole Star Trek series on the air during the fall of 1994. However, while DS9 was syndicated and thus aired nationally on multiple networks, Star Trek:Voyager on the then-new UPN network. One of the most acclaimed episodes of DS9 is "In the Pale Moonlight" in Episode 13 of Season 6, involving a plot with Sisko, Garak, and the Dominion war. Other noted episodes include "Little Green Men" which takes Star Trek to Roswell, New Mexico, "Call to Arms" for its role in the series' War-saga, and "Take Me Out To The Holosuite" noted for featuring the sport baseball. "...Nor the Battle to the Strong"
"Treachery, Faith and the Great River"
"Inter Arma Enim Silent Leges"
"The Changing Face of Evil"
Although DS9's ratings remained solid, it was never as successful as the syndicated Star Trek: The Next Generation, with approximately 6% versus 11% of US households watched during sweeps months. However, it continued to perform better than its franchise sibling Star Trek: Voyager, which averaged around 5% according to the Nielsen ratings. One factor was the increasingly crowded syndicated marketplace, which provided viewers with a number of alternative television series to follow. Another factor was the minimal promotion for DS9, as Paramount focused its efforts on its flagship network series Star Trek: Voyager. From 1995 onwards, most of the independent stations joined new networks (UPN and The WB), and these primetime shows gradually pushed syndicated programming into less favorable time slots as the US television market expanded from four networks (in 1987 when TNG premiered) to six. DS9 was well received by critics, with TV Guide describing it as "the best acted, written, produced and altogether finest" Star Trek series. Despite debuting in the shadow of The Next Generation, DS9 achieved a considerable level of success in its own right. According to a press release through Newswire on April 7, 1999, it was the #1 syndicated show in the United States for adults 18–49 and 25–54. The characters of DS9 were featured on the cover of TV Guide ten times during its run, including several "special issue" editions in which a set of four different-covered versions were printed. The series won a number of awards. It was nominated for Emmy Awards every year of its run, including for makeup, cinematography, art direction, special effects, hairstyling, music (direction and composition), and costumes. Of these, it won two for makeup (for "Captive Pursuit" and "Distant Voices"), one for special visual effects (for "Emissary"), and one for its main title theme music (by composer Dennis McCarthy). It was also nominated for two Hugo Awards in the category of Best Dramatic Presentation for "The Visitor" and "Trials and Tribble-ations". Deep Space Nine drew praise from African-American, Latino and other minority viewers for its handling of the minority characters, particularly the Sisko family members. In addition, actor Alexander Siddig (who portrayed Dr. Bashir) expressed his enthusiasm for the fact that he, with his English accent, unusual screen name at time of casting (Siddig El Fadil), and North African heritage was a main character on a prominent television series despite being not as easily racially identifiable to audiences as many other actors and characters were on TV at the time. Andrew J. Robinson commented on DS9 not being as popular as its predecessors: "It's not the most popular because it's the most morally ambiguous... Whenever you have characters who are gray rather than black and white... Although they are more interesting, they are more difficult for people to get a handle on. I loved DS9 because they were gray, because the characters were not easily definable, but that's not for everybody". Author Terry J. Erdmann commented: "DS9 was never as popular as its two predecessors, although it arguably was a more critically acclaimed series". In 2018, IndieWire ranked Star Trek: Deep Space Nine as the 3rd best space science fiction show set in outer space, while placing Star Trek (1966-1969) in 8th place and Star Trek:The Next Generation (1987-1994) in 12th place among other shows in this genre, including 18 overall. Babylon 5, another science fiction series with a similar premise, set on a space station, aired around the same period as Deep Space 9. Babylon 5 creator J. Michael Straczynski indicated that Paramount Television was aware of his concept as early as 1989, when he attempted to sell the show to the studio, and provided them with the series bible, pilot script, artwork, lengthy character background histories, and plot synopses for 22 "or so planned episodes taken from the overall course of the planned series". Paramount declined to produce Babylon 5, but later announced Deep Space Nine was in development, two months after Warner Bros. announced its plans for Babylon 5. Straczynski stated that, even though he was confident that Deep Space Nine producer/creators Rick Berman and Michael Piller had not seen this material, he suspected that Paramount executives used his bible and scripts to steer development of Deep Space Nine. He and Warner did not file suit against Paramount, largely because Straczynski did not see it as a productive option, with negative repercussions for both TV series. In 1993 he responded to a Deep Space Nine fan who saw the lack of legal action as proof that Straczynski's allegation was unfounded, "If there is any (to use your term) winking and nudging going on, it's on the level of 'Okay, YOU (Paramount) know what happened, and *I* know what happened, but let's try to be grownup about it for now,' though I must say that the shapechanging thing nearly tipped me back over the edge again. If there are no more major similarities that crop up in the next few weeks or months, with luck we can continue that way." In a 2007 interview with iF magazine, George Takei, who had played the character Hikaru Sulu in The Original Series, criticized DS9 for being the polar opposite of Gene Roddenberry's philosophy and vision of the future. However, D. C. Fontana stated in an interview that Roddenberry would have liked it and its dark themes, since he was a World War II veteran. Bjo Trimble, one of the major forces behind the letter-writing campaign that helped renew the original series for its third season, commented that she thought Roddenberry would have "come to like DS9, had he lived to see it," and that "the only reason there were not full battles in early Star Trek is lack of funds to pull it off, and lack of technology to show it. Otherwise, GR would certainly have added it; he knew what audiences liked". Roddenberry is quoted in The Making of Star Trek DS9 as having doubts that a non-exploration show could work, and being displeased with early concepts presented to him in 1991. However, Rick Berman stated in the Star Trek: Deep Space Nine Companion that Roddenberry had given him his blessing for developing it close to his death. At Shore Leave 14 in July 1992, Majel Barrett commented on Roddenberry's involvement, saying: "He knew about it, but he was not about to become involved. He had done what he wanted to do and that was it. He just wished them Godspeed and go ahead. And as long as the name Star Trek is on it, yes, the estate will have a part of the action." I think Deep Space [Nine] was the show that really took Star Trek as far as you could take it. You have the original series which is a sort of a landmark, it changes everything about the way science fiction is presented on television, at least space-based science fiction. Then you have Next Generation which, for all of its legitimate achievements is still a riff on the original. It's still sort of like, ok, it's another star ship and it's another captain – it's different but it's still a riff on the original. Here comes Deep Space [Nine] and it just runs the table in a different way. It just says ok, you think you know what Star Trek is, let's put it on a space station, and let's make it darker. Let's make it a continuing story, and let's continually challenge your assumptions about what this American icon means. And I think it was the ultimate achievement for the franchise. Personally, I think it's the best of all of them, I think it's an amazing piece of work. On June 30, 1993, between seasons one and two, DS9 followed the example of other Star Trek series in releasing the original score from its pilot episode on CD. The title theme was also made available as a CD single. Music from several other episodes is included on The Best of Star Trek releases. Originally created in the hope that Frank Sinatra Jr. would take the role, the character Vic Fontaine (instead played by 1960s heart throb James Darren) was introduced in the sixth-season episode "His Way". The character was a self-aware holographic Las Vegas lounge singer and night club owner from the early 1960s. Vic was popular with the station's crew and performed many period songs by, among others, Frank Sinatra and Nat King Cole. Darren's role allowed him to release This One's from the Heart on August 24, 1999, featuring songs that Vic sang in the show and other period pieces. On February 12, 2013, La La Land Records released a limited edition, four-disc soundtrack collection entitled the Star Trek: Deep Space Nine Collection. The discs contain various cues from episodes scored by Dennis McCarthy, Jay Chattaway, David Bell, Paul Baillargeon, John Debney, Richard Bellis and Gregory Smith. Only 3000 copies of the collection were printed. Episodes of DS9 were made available on VHS cassettes. The series was released on VHS in the United Kingdom starting August 2, 1993. Each video cassette contained two episodes and unique artwork and character/plot information. The first VHS release in the United States came on November 19, 1996. Beginning in 1996, DS9 began releases on LaserDisc. Picture and sound quality in this format was significantly better than that of VHS cassettes; however, the Laserdisc format was discontinued in 1997. Only 30 discs, or the first 60 episodes, were released, comprising the first, second and part of the third season before Pioneer halted its production of Star Trek laserdiscs in October 1999. DS9 LaserDiscs were also produced for the Japanese and European markets. In Japan, the first five seasons were released in a series of ten boxed sets (two per season) before they were canceled around the same time as the US releases. In Europe, a select few DS9 episodes were released on PAL laserdisc: "Emissary", also included in the boxed set Star Trek: The Pilots; "The Way of the Warrior", parts 1 and 2; and "Trials and Tribble-ations" from DS9, "The Trouble with Tribbles" from Star Trek: The Original Series, and "More Tribbles, More Troubles" from Star Trek: The Animated Series. Following the DVD release of Star Trek: The Next Generation in 2002, DS9 was released on DVD beginning in February 2003. DS9 was released in boxed sets of one season each, which were released approximately one month apart. Each season contains several "special features", including a biographical look at a main character, information from make-up designer Michael Westmore on how various aliens were created, and interviews with cast members and crew members. The sets also include "Section 31" easter eggs that give a brief look at other aspects of the series. The Region 2 and 4 DVDs also come with bonus CD-ROM discs that allow users to build a "virtual" DS9 on their computer with each release (this software can no longer be installed as the on-line registration is no longer available). On October 26, 2004, a boxed set of all seven season sets was also released. In 2017, Ira Steven Behr announced he had reconvened much of the former cast and crew of Deep Space Nine for a documentary film entitled What We Left Behind. It had a very positive response and surpassed its fundraising goals, and this success lead to ground-breaking conversions of Deep Space Nine footage into higher definition although it caused some delays. A screening version was released in late 2018 in Hollywood, New York, and at the Destination Star Trek convention in the U.K.
By of February 2017, the documentary was partially finished, according to Behr, with an Indiegogo fundraising page set up to crowdsource the rest of the money needed to complete it. In addition to interviews with cast and crew, the documentary will explore Deep Space Nine's legacy; Behr also reconvened the series' old writers' room to develop a script for the first episode of an imagined eighth season, which will be featured in the film. In 2017, a tentative release date was set for 2018. In the summer of 2018, the makers scheduled special release events starting in October 2018. A version was able to be screened at these special release events at Paramount in Hollywood and some other locations, but a decision was made to delay the media release to increase the amount of high-definition conversions. In 2017, a fundraiser for the documentary surpassed its target of nearly $150,000 within a day of going live. It went on to raise over half a million USD by March 2017, almost four times the amount requested. When it concluded it had raised over 631 thousand USD from thousands of donators. Development of What We Left Behind took extra time due in part to the large amount of material for editing and technical challenges. This includes crafting special effects footage and working with CBS to make high definition scans. The makers also expanded the amount of footage that is being remastered, and innovated with a 16:9 scan of the original DS9 film. In August 2018, it was announced the documentary would have original music scored by Star Trek veterans Dennis McCarthy (256 Star Trek episodes scored) and Kevin Kiner (10 Star Trek episodes scored). The documentary's producer is Kai de Mello-Folsom, in consultation with the trekiverse family including Star Trek franchise legends such as Michael Okuda, Jonathan West, and Doug Drexler. Many cast and crew were able to attend the screening in Los Angeles, at the Paramount Studios in Hollywood. The strong community support and overall response, as well as the creative team's access to resources to create the high-definition sequences led to a delay to increase the sequences filmed in higher-definition for the documentary. Although the screening version was completed and could have been released as-is, a creative decision was made to undertake producing more Deep Space Nine sequences into high definition. One teaser released concept art of a Star Trek spacecraft shown in the documentary, shown in an animated sequence in the production. The spacecraft design was made by John Eaves, who designed many spacecraft in the franchise's television shows and theatrical films. Pocket Books has published several dozen books based on DS9. Some of these were novelizations of memorable episodes, such as "Emissary", "The Search" and "What You Leave Behind", which were usually published a few days after the episode aired in the United States. Several novels were part of "crossover" series between the Star Trek franchises, while others were part of other franchises but dealt with events laid out in DS9. For example, The Battle of Betazed tells of how Deanna Troi attempted to resist the Dominion occupation of her world (mentioned in the episode "In the Pale Moonlight"). Most focus on the station and its crew, with a notable exception being Ira Steven Behr and Robert Hewitt Wolfe's Legends of the Ferengi. The "Millennium" series by Judith and Garfield Reeves-Stevens, published by Pocket Books beginning in 2000, consists of The Fall of Terok Nor (book 1), The War of the Prophets (book 2), and Inferno (book 3). The series lays out an alternate ending to DS9 (the novels were actually written before the series concluded) in which a second wormhole is created by the actions of a number of shady characters, destroying the station. In the space-time distortion that occurs, most of the crew are transported 25 years into the future—a future in which the Federation and its allies are virtually crushed and a fanatical sect of Bajorans who worships the Pah-wraiths have ascended to power and plan to destroy the universe to bring about a higher state of existence. Inferno ends the series as an unexpected mode of time travel is discovered after the end of the universe, allowing the DS9 crew to alter past events. Avatar, a two-part novel published on May 1, 2001, picked up where the series left off. It began season 8 of DS9, into which A Stitch in Time (a biographical look at the life of Garak, written by Andrew Robinson himself) was incorporated retroactively. The events of "What You Leave Behind", DS9's series finale, caused some radical changes to occur in Season 8. As Benjamin Sisko had entered the Celestial Temple, Colonel Kira was given command of the station while a new commander named Elias Vaughn took over her position, Garak became the leader of post-war Cardassia, Odo helped the Changelings rebuild, and Rom presided over the Ferengi Alliance. Other publications, such as the Deep Space Nine Technical Manual and Deep Space Nine Companion, are common to most of the Trek series. The DS9 Companion contains detailed episode guides and interviews with actors, writers, directors and other staff members. DS9 series influences were included in role-playing game reference books from Last Unicorn Games and Decipher, Inc. Additionally, several novels have also been released in audio form, narrated by Rene Auberjonois and Armin Shimerman among others. Outside its line of novels, DS9 has been the subject of several comic books published by Malibu Comics, Wildstorm Comics, Marvel Comics and IDW. One comic is a spin-off, detailing Nog’s experiences at the Starfleet Academy. Another DS9 comic book series became an exceptional example of licensed Star Trek works influencing each other, as a major character from Wildstorm's N-Vector, Tiris Jast, appeared in the Avatar, Part I novel. Several video games focusing on DS9 have been released. The first was Crossroads of Time, a 1995 side-scrolling game released for the Super NES and Genesis. The game takes place around the time of the series premiere, borrowing some stories from early episodes such as "Past Prologue" and creating others. A number of problems reportedly impeded the game's development process, and it was met with mixed reactions. Three DS9-themed games were released for the PC: Harbinger in 1996, The Fallen in 2000, and Dominion Wars in 2001. A board game was released as part of the now-defunct "component board game" series, which included an intercompatible board game for Star Trek: The Next Generation. DS9's role-playing book was one of several that failed to be released into wide circulation when Decipher, then publisher of the Star Trek role-playing game, discontinued its line. The series features prominently in the Star Trek Customizable Card Game, particularly its second edition. In the game's first edition, Deep Space Nine is the titular fifth set, followed by one entitled "The Dominion" and several other DS9-themed sets. In the second edition, there are two types of cards for the United Federation of Planets, which may be placed at Earth or Deep Space Nine. The Ferengi, Dominion, Cardassian, Bajoran, and Maquis affiliations are primarily DS9-derived material, while the Klingon affiliation also borrows strongly from it. The PC game Star Trek Online features Deep Space Nine as a trading hub. The lower ring (The Promenade) contains vendors, and the upper ring offers views of surrounding space. In addition, the most recent expansion “Victory is Life” is focused around DS9 and the Gamma Quadrant. Along with the rest of the Star Trek franchise, DS9 has been the subject of much merchandising. Action figures, keychains, models, and other items have been released. The station itself, which is highly recognizable and iconic of the series, is the subject of many of these items. Paramount also sells Starfleet uniforms; among the styles is the so-called "DS9-style" uniform, which is primarily black with a division color (red for command, yellow for engineering or security, blue/green for medical and the sciences) on the shoulders and a grayish-purple undershirt is seen underneath the uniform. DS9 was represented at Star Trek: The Experience, an attraction at the Las Vegas Hilton that recreated both Quark’s Bar & Restaurant and the Promenade. The former served Star Trek-style food and drinks, and hosted gatherings such as conventions. The latter (called the Shopping Promenade) sold various souvenirs; among the items for sale were "official" Starfleet uniforms and action figures. The attraction closed in September 2008. ^ "Star Trek: Deep Space Nine - Watch Full Episodes". CBS.com. Retrieved June 29, 2017. ^ "Star Trek DS9 Debuted 24 Years Ago Today". Startrek.com. Retrieved June 29, 2017. ^ a b c d The DVD set Star Trek: Deep Space Nine—The Complete First Season includes the featurette "A Bold New Beginning", in which Berman and others explain the series's early design phases and their goals in creating it. ^ a b Source: "New Frontiers". DVD extra included with Star Trek: Deep Space Nine – The Complete Second Season. ^ "Trek Expo Tulsa, Oklahoma". sidcity.net (official site). June 25, 2005. Archived from the original on June 26, 2008. Retrieved July 8, 2008. ^ Source: "Crew Dossier – Jadzia Dax". Included with Star Trek: Deep Space Nine – The Complete Second Season. ^ Source: "Charting New Territory". DVD extra included with Star Trek: Deep Space Nine – The Complete Fourth Season. Of Worf, writer/producer Robert Hewitt Wolfe said in an October 20, 2002 interview that the studio felt DS9's ratings were sagging at the end of the third season, and he and the other writers were asked to give viewers a new reason to watch. Their answer was to make Worf a part of the cast. ^ Combs, Jeffrey. Interview conducted January 30, 2003. Included as a "Hidden File" with Star Trek: Deep Space Nine – The Complete Third Season. ^ Okuda, Michaeèl; Okuda, Denise (1999). The Star Trek Encyclopedia. New York: Pocket Books. p. 837. ISBN 0671536095. ^ "IMDb Star Trek: Deep Space Nine - episode list". ^ "Deep Space Nine". Archived from the original on October 25, 2009. Retrieved December 5, 2007. ^ "The Way of the Warrior (episode)". ^ Whitbrook, James. "The Detailed, Depressing Reason Deep Space Nine and Voyager May Never Get Full HD Versions". io9. Univision Communications. Retrieved February 3, 2017. ^ a b c "'Star Trek: Deep Space Nine' — The 20 Greatest Episodes". The Hollywood Reporter. Retrieved April 8, 2019. ^ "eBooks - Star Trek: Deep Space Nine: Unity by S. D. Perry - eReader.com". January 4, 2008. Archived from the original on January 4, 2008. Retrieved June 29, 2017. ^ Pounds, Michael Charles (May 2009). "Explorers". African Identities. 7 (2): 209–235. doi:10.1080/14725840902808892. ^ "Star Trek Deep Space Nine - The Complete Sixth Season: Avery Brooks, Rene Auberjonois, Cirroc Lofton, Alexander Siddig, Colm Meaney, Nana Visitor, Armin Shimerman, Terry Farrell, Michael Dorn, Mark Allen Shepherd, Randy James, Robert Ford, Allan Eastman, Allan Kroeker, Anson Williams, David Livingston, JesÃºs Salvador TreviÃ±o, LeVar Burton: Movies & TV". Amazon.com. Retrieved June 29, 2017. ^ "Robinson On Why He Couldn't Leave Garak Behind: Andrew J. Robinson". TrekToday. 2002. Retrieved January 5, 2015. ^ Walker, Adam (2012). "Paula M. Block & Terry J. Erdmann: TNG 365 Interview, Part 2". Trekcore. Retrieved December 28, 2014. ^ Miller, Liz Shannon; Miller, Liz Shannon (April 18, 2018). "The 18 Best Sci-Fi TV Shows Set In Space, Ranked". IndieWire. Retrieved February 27, 2019. ^ "J. Michael Straczynski post". Jmsnews.com. December 7, 1994. Retrieved November 7, 2010. ^ "J. Michael Straczynski commenting on B5's attempted sale to Paramount + B5/DS9 similarities". Jmsnews.com. January 13, 1996. Retrieved November 7, 2010. ^ "J. Michael Straczynski post from 1992". The J. Michael Straczynski Message Archive (jms.com). February 4, 1992. Retrieved October 26, 2009. ^ "J. Michael Straczynski post from 1997". The J. Michael Straczynski Message Archive (jms.com). September 15, 1997. ^ a b "B5 information from GEnie". National Technical University of Athens. Retrieved July 6, 2016. ^ Elliot, Sean (November 20, 2007). "Exclusive: George Takei Thanks Fans For 40 Years of 'Star Trek'". iF Magazine. Archived from the original on November 23, 2007. Retrieved November 20, 2007. ^ Pascale, Anthony (August 16, 2007). "Interview – Dorothy Fontana On New Comics, New Novel + Canon, DS9, ENT & New Movie". TrekMovie.com. Retrieved December 28, 2014. ^ Tyler, Greg (August 1999). "Bjo Trimble email interview". trekplace.com. Retrieved December 28, 2014. ^ Tyler, Greg (July 1992). "Star Trek Deep Space Nine Pre-Premiere Bible". Trek Writer's Guild. Retrieved December 28, 2014. ^ "Star Trek Deep Space Nine - The Complete Seventh Season: Avery Brooks, Rene Auberjonois, Cirroc Lofton, Alexander Siddig, Colm Meaney, Nana Visitor, Armin Shimerman, Terry Farrell, Michael Dorn, Mark Allen Shepherd, Randy James, Robert Ford, Allan Kroeker, Anson Williams, Chip Chalmers, David Livingston, John T. Kretchmer, Jonathan West, LeVar Burton: Movies & TV". Amazon.com. Retrieved June 29, 2017. ^ "Star Trek Soundtracks: Emissary". Retrieved March 6, 2013. ^ "Star Trek Soundtracks: The Best of Star Trek: Volume 2". Retrieved March 6, 2013. ^ Erdmann, Terry J.; Block, Paula N. (2000). Star Trek: Deep Space Nine Companion. New York: Pocket Books. p. 562. ISBN 0671501062. Retrieved June 29, 2017. ^ "LA LA LAND RECORDS, Star Trek: Deep Space Nine". Archived from the original on March 5, 2013. Retrieved March 11, 2013. ^ "Star Trek Soundtracks: Star Trek: Deep Space Nine Collection". Retrieved March 6, 2013. ^ Young, Blaine (November 22, 2003). "Star Trek: Deep Space Nine". Blam Entertainment Group. Retrieved January 31, 2015. ^ a b c d e "What We Left Behind World Premiere – TrekToday". ^ a b c d Pascale, Anthony. "Star Trek: DS9 Composer Dennis McCarthy To Score 'What We Left Behind,' Backer Premieres Announced". TrekMovie.com. ^ a b c d "See 'Star Trek: Deep Space Nine' in HD for the First Time". Star Trek. ^ "Deep Space Nine documentary gets crowdfunding push". Mashable. February 9, 2017. Retrieved February 9, 2017. ^ Elderkin, Beth (February 8, 2017). "A New Deep Space Nine Documentary Reveals What Would Have Happened in Season Eight". io9. Retrieved February 9, 2017. ^ "What We Left Behind: Star Trek Deep Space Nine Doc". Indiegogo. Retrieved February 9, 2017. ^ Howell, Elizabeth; March 10, Space com Contributor; ET, 2017 11:00am. "'Star Trek: Deep Space Nine' Doc Warps Way Beyond Crowdfunding Goal". Space.com. ^ Hadyniak, Kyle (March 10, 2017). "DS9 Documentary Reaches Final Day, Team Releases Thank You Video [UPDATED]". ^ a b "'Star Trek: Deep Space Nine' Documentary Offers New Update". Star Trek. ^ Pascale, Anthony. "Editing Completed For 'What We Left Behind,' Star Trek: DS9 Documentary Expected To Be Released This Year". TrekMovie.com. ^ a b Staff, TrekMovie com. "'What We Left Behind' Doc Unveils 'Star Trek: Deep Space Nine' Season 8 Starship". TrekMovie.com. ^ "Maurice Molyneaux: Deep Space Nine (Genesis/SNES)". Archived from the original on February 6, 2005. Retrieved June 29, 2017. ^ "Star Trek Deep Space Nine: The Board Game | Board Game". BoardGameGeek. Retrieved June 29, 2017. ^ "Older Decipher Star Trek Card Products". Jklm.net. Retrieved June 29, 2017. Wikimedia Commons has media related to Star Trek: Deep Space Nine.